Members of the Greater Hartford Youth Leadership Academy take a photo with Nelba Marquez-Greene, kneeling at right, before boarding a bus headed to a rally in Newtown, Conn. Marquez-Greene's daughter Ana died in the Newtown school shooting. His head was soaked with blood. The 2008 shootout killed one man and wounded six young bystanders. Among the survivors, Marquez had the most serious injuries. He was that 7-year-old boy bleeding from a stray bullet to the head. 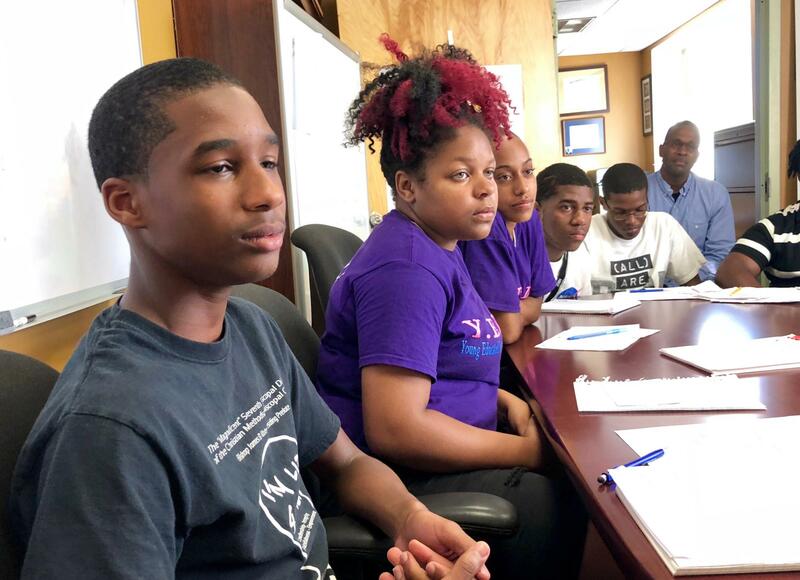 Marquez has been advocating against gun violence as part of the Greater Hartford Youth Leadership Academy, a group of 15 students of color that has devoted Saturdays over the past year to research and strategizing. They meet and go over heavy stuff like poverty, mass incarceration, educational disparities and the effects of trauma — some of the societal issues, they explain, that factor into the cycle of gun violence in cities like Hartford. The youth leadership academy has presented its ideas to Hartford leaders and politicians. They include sweeping recommendations: alleviating poverty, improving schools and creating more jobs, along with calling for “common sense” gun reform. Next on their agenda is getting the vote out for the midterm elections, even if they are too young to vote themselves. Most of the members are teenagers in high school, although a few are younger. Many bear connections to gun violence, so it feels personal when they come across apathy instead of outrage. The Greater Hartford Youth Leadership Academy traveled to Washington, D.C., for the March For Our Lives rally earlier this year. 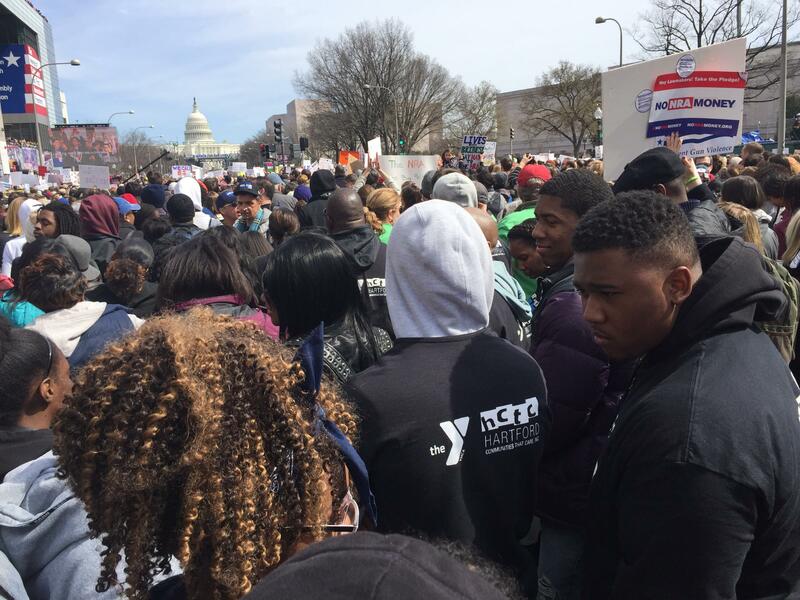 The Hartford group traveled to Washington, D.C., for a big March For Our Lives rally in the aftermath of the Parkland, Fla., school shooting. Students later recalled the lopsided attention on another group of travelers from Connecticut — those who came from the suburb of Newtown. 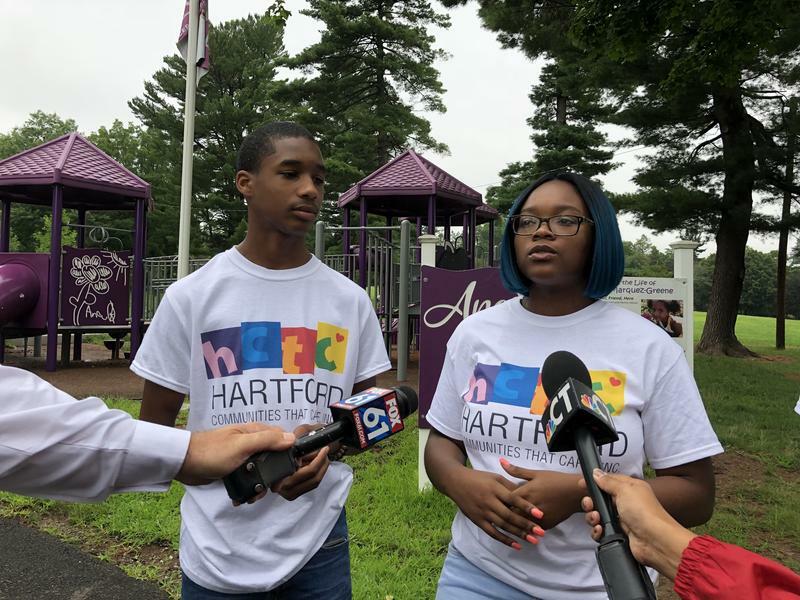 It was a weekday evening in August and Fee sat near Nelba Marquez-Greene in the offices of Hartford Communities That Care, a nonprofit in north Hartford that runs the youth leadership academy. Marquez-Greene’s daughter, Ana, died in the 2012 mass shooting at Sandy Hook Elementary School in Newtown. Ana was 6. Another March For Our Lives rally was happening in a few days — this time, in Newtown. And thanks to Marquez-Greene, the leadership academy from Hartford would have a speaking role. But first, she wanted to meet the students and encourage them to keep speaking up. Joshua Fee, 15, left, listens to Newtown mom Nelba Marquez-Greene. Fee says gun violence in urban communities is seen as "normal ... That's not normal, what can we do to stop it?" Long before Marquez-Greene’s family settled in Newtown, Hartford was home. This is where Marquez-Greene went to public high school and where her husband, saxophonist Jimmy Greene, began honing his jazz talent. The high school sweethearts bought their first house here. But they also knew of gun violence in the cities. “So we decided … that we would work very hard and move to a safe community,” said Marquez-Greene, a licensed marriage and family therapist. After living in Canada for a few years, the family of four relocated to Connecticut. They moved to the Sandy Hook village of Newtown months before the December 14 shooting. The Hartford youth advocates were curious how Marquez-Greene handled her loss. What went through her mind, one boy asked, when she got word there was a shooting at Sandy Hook Elementary? Her older son and first-grader Ana were both Sandy Hook students. Ana was the only black and brown child who died at Sandy Hook, Marquez-Greene pointed out. She said race and geography often affect how people respond to victims of gun violence, and that she has seen the inequity up close. Since the massacre, Marquez-Greene has met with grieving mothers from Hartford and other cities who have also lost their children to gun violence, she said. Voter registration at the March For Our Lives event in Newtown, Conn.
That mindset brought her to this conference room in north Hartford. 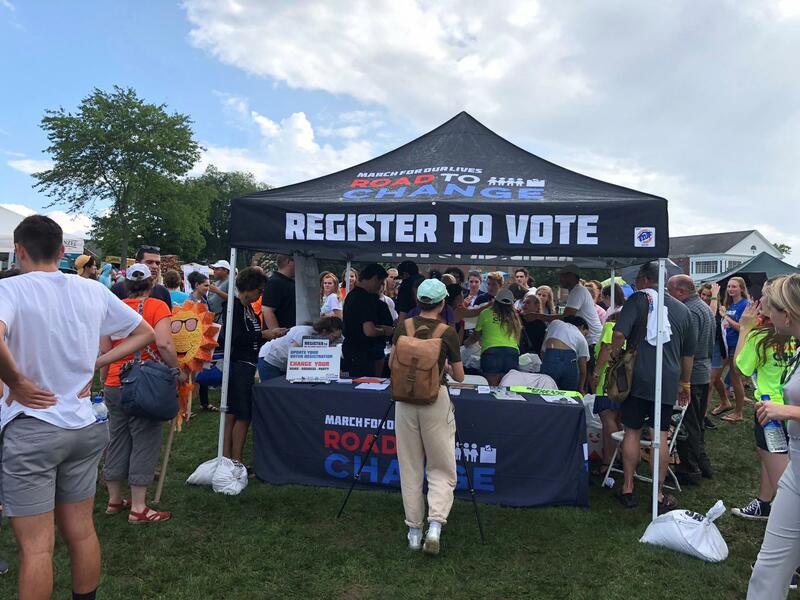 All summer, young gun-control activists in charge of the national March For Our Lives movement had been traveling across the country on a “Road To Change” bus tour, staging rallies and registering people to vote. The August 12 visit to Newtown would be the last stop. Marquez-Greene said she spoke with organizers and they arranged for a charter bus to bring the students from Hartford, so their voices would be included. She told the students they give her hope. The charter bus arrived on a Sunday morning. 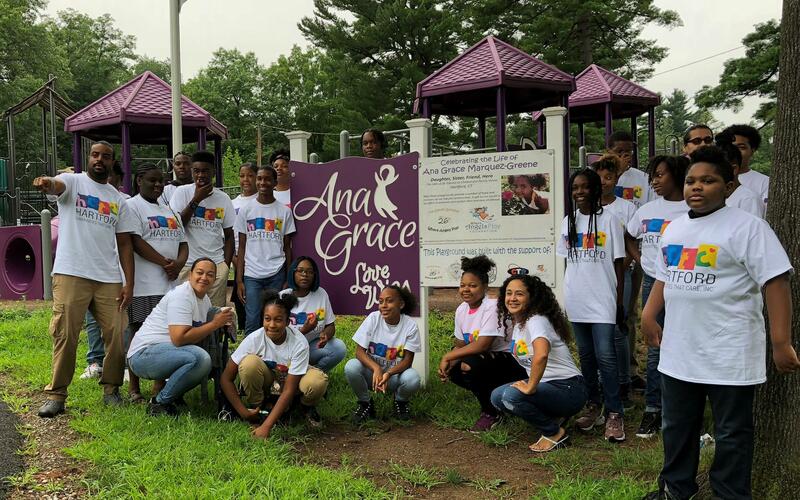 It parked alongside a playground in Hartford that was built in memory of Ana Grace Marquez-Greene and other victims of gun violence. 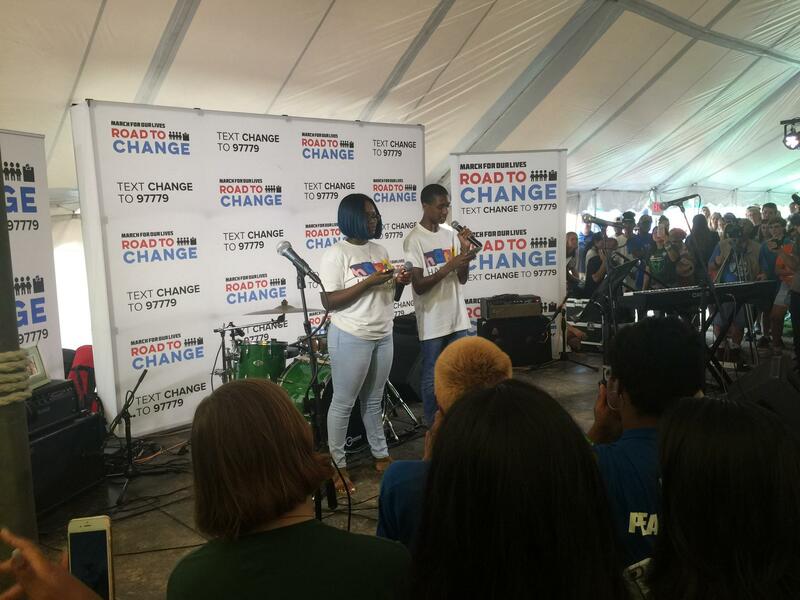 Greater Hartford Youth Leadership Academy members Dayzra Bournes, left, and Joshua Fee give a speech at the March For Our Lives rally in Newtown on August 12. In Newtown, hundreds of people and a line of TV cameras gathered under a big white tent on an expansive green. Tyrek Marquez, the teen who was shot in Hartford when he was 7, stood on stage with activists such as Emma Gonzalez from Parkland. After several speakers had their turn, Joshua Fee and Dayzra Bournes went up to the mic. They were chosen to represent Hartford. “Thank you for inviting us to participate in today’s gathering, bringing young people at the forefront of a movement that should not be ours to fix,” Bournes, 17, said. The cheers were loud and steady. The Hartford group met new allies that day. And by the time the rally wrapped up and students in the leadership academy walked back to their bus, a few of the teenagers said they felt hopeful they weren’t alone. On the first Saturday of autumn, the crew got back together at their usual meeting spot at Hartford Communities That Care. A full agenda was on deck. 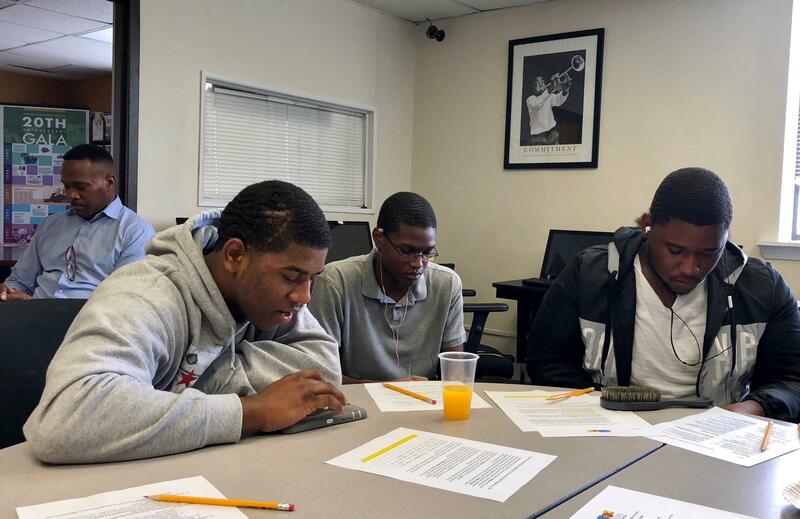 Tyrek Marquez, left, works with the Greater Hartford Youth Leadership Academy during a recent Saturday meeting at Hartford Communities That Care. Tyrek Marquez was taking these reasons to Los Angeles, too. In late September, he flew across the country as one of 100 delegates chosen for a national summit called #WeVoteNext, an initiative founded by actress Yara Shahidi to mobilize young voters. A mission for Marquez was to bring back strategies to help get the vote out in November. Marquez smiled when he talked about his own opportunity to cast a ballot next year. His 18th birthday is in the spring.